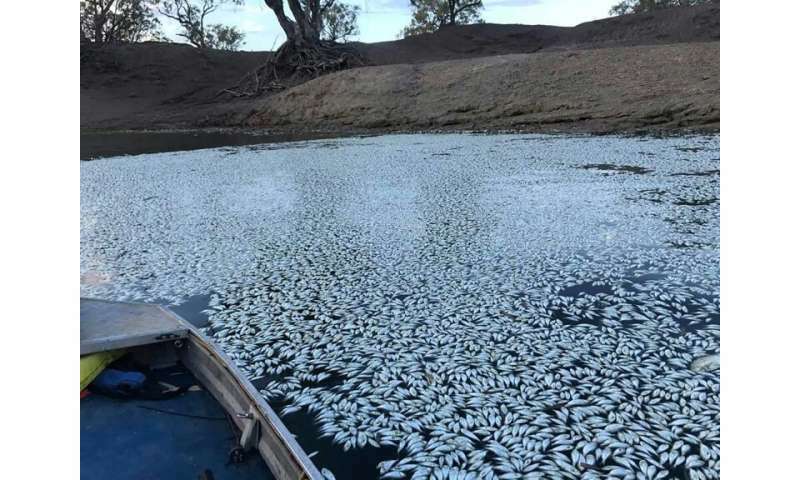 The authority that oversees Australia's largest river system was accused of "maladministration", "gross negligence" and ignoring climate science Thursday, as its waterways were carpeted with hundreds of thousands of dead fish. A Royal Commission report into the Murray-Darling Basin Authority—which happened to coincide with a series of mass fish kills—was scathing in its assessment, accusing the body of illegality. A South Australian inquest said the authority acted unlawfully in setting water levels while it "completely ignored" climate change projections. "Politics rather than science ultimately drove the setting" of limits on the amount of water that could be taken out of the river, the report said. The commission charged that the authority failed to be guided by "environmental priorities", as required by law. "It is an unlawful approach. It is maladministration." Up to a million were killed last month—with scientists pointing to low water and oxygen levels as well as possibly toxic algae—in drought battered eastern Australia. The royal commission recommended a complete overhaul of the water river management plan, with revised levels based on "the best available scientific knowledge".